Christian scientists who believe in a young earth are citing the recent discovery of fossilized silk cocoons as evidence that many fossilized materials are much younger than evolutionists allege. As previously reported, scientists have repeatedly been surprised by the discoveries of various delicate biomaterials that have supposedly remained intact for millions of years. These materials include shell proteins, ancient embryos, dinosaur skin, and dinosaur blood vessels. Now scientists are puzzled by another material that purportedly survived millions of years: silk cocoons. A team of Polish and Brazilian researchers published a study in the journal “Scientific Reports.” The researchers say they analyzed marine deposits in southern Brazil and identified “intriguing fossils” that appear to be larval cases constructed by caddisflies. Caddisfly larvae make their protective cases, or cocoons, using secreted silk. The researchers were surprised to find a collection of these cocoons in Brazilian marine deposits that reportedly date back to the Early Permian era, or 295 million years ago. The cases found in the marine layer were all 0.5-2.0 inches long, and many of the cases had plant fragments attached to them. 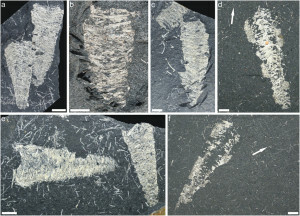 “As these caddisfly-like larval cases are the oldest reported so far and come from a marine palaeoenvironment of the Gondwanan sector of the Pangea supercontinent, they would not only push back the fossil record of true caddisflies, but also shed a new light on ecology and behaviour at their very early stages of evolution,” the researchers wrote. Brian Thomas, Science Writer for the Institute for Creation Research (ICR), says this discovery actually poses a significant challenge to evolutionists for two reasons. First, it shows that caddisflies experienced negligible evolutionary development during millions and millions of years. Furthermore, Thomas noted, the silk discovered by the researchers would have trouble surviving for nearly 300 million years.